It was reintroduced for a brief period at the end of May, and we got our hands on it then – but did it live up to the expectation of a full-fledged nacho experience in the palm of your hand? Right off the bat, we noticed that it was much smaller than what we thought it would be. 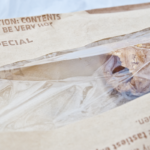 The promotional imagery displayed a thick tortilla shell stuffed with a thin layer of ingredients. We know better than to trust promotional images with regards to fast food, but this just felt embarrassing. The nacho is “stuft” with a combination of standard Taco Bell ground beef or shredded chicken; cheese sauce, “crunchy red strips”, and sour cream. We had a hard time just figuring out how to eat the thing. Should we bit in from one of the points, or sides of the triangle? We both decided to start at a corner, but this led to problems down the line once we had eaten down to the opposite edge. It became incredibly difficult to eat what had turned into a very, very long soft shell taco. Once we started eating, we were divided right away on the inclusion of the sour cream. 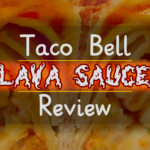 William thought it was a great addition, adding a balancing coolness to the tangy nacho cheese sauce and spicy beef, while Paula thought it added too much moisture and diluted the inherent spice level. The “red strips” were crunchy strips of corn, but the high moisture level of the Stuft Nacho caused them to lose their crunch. We really felt like these should have been Fritos chips, but that might have made them too similar to the Crunchwrap Sliders. 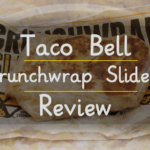 Frankly that would be a good thing – Crunchwrap Sliders are the preferable choice compared to the Grilled Stuft Nacho. 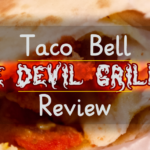 The Nacho went well with the now-discontinued Diablo sauce (check out our review here) but really, what doesn’t? The spice level of an unvarnished Stuft Nacho was pretty low, so the addition of some extra spice is welcome. For only $1.50, this wasn’t the worst value we’ve ever had – but it wasn’t really the best, either. We know it came before the Crunchwrap Sliders, but in their wake this item just feels like a pale imitation. We’d rather get the Beefy Fritos Burrito for 50 cents less, swapping out the sour cream for seasoned rice. Frankly, we’d rather just wait for the Beefy Crunch Burrito to make its comeback already.